The emblem worn by the present Sisters is based on the original blue braided Monogram worn from the founding era in SA from 1866. This original Monogram reflected a core emphasis on the Holy Family in the spirituality of the co-founders, Mary MacKillop [1842-1909] and Father Julian Edmund Tenison Woods [1832-1889]. 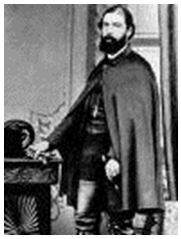 In his religious formation before coming to Australia in 1855, the young Julian had come under the influence of several Religions who variously promoted devotion to the Holy Family: the English Passionists, the French Marist Fathers and the Sisters of Saint Joseph of Le Puy, France, who impressed him by the simple tenor of their ministry among the poor, their spirituality of companionship with people and their belief that the Blessed Trinity is mirrored in human relationships, ideally like those of Jesus’ own family. 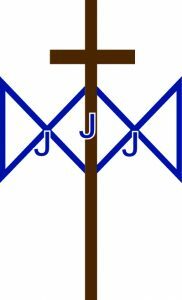 The design of the Josephite Monogram is clearly drawn from the early Marist seals. Across the Marist family of Congregations, these seals still feature the combined the letters ‘A’ and ‘M’ for “Ave Maria” of Mary’s Annunciation. To the letters ‘A’ and ‘M’ of the Marist seal Julian added 3 Js in honour of Jesus, Joseph and John the Baptist. 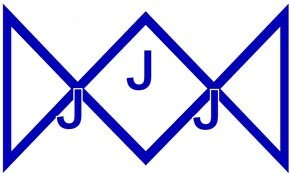 The third J on the Monogram registered Julian’s particular devotion to John the Baptist. Whilst in France he would have encountered Western European art [eg by Murillo] portraying John and Jesus as small boys, each with a lamb, hinting towards their later martyrdom. Perhaps this led to the insight expressed in the original Rule that the young John accompanied the young Jesus as both grew up, responding to the call of God in their lives. 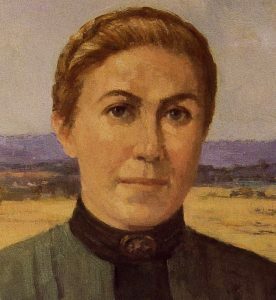 Throughout her compassionate life Mother Mary of the Cross gave clear witness to having embodied all that the founding Rule hoped to bring forward for the Sisters’ lives and ministry through this theme of “companionship”. Scripture witnesses not only to Mary’s call and response but to the companion journeys in faith of Joseph and John and, implicitly, of John’s parents, Elizabeth and Zachariah – persons in a family of faith who live in authentic humility before God, able to question God even as they say their “Yes”. Mary’s ‘Magnificat’ and Zachariah’s ‘Benedictus’ are therefore key resources for those who wear the Monogram or later emblems based on it. The emblem worn by a Sister is meant to ‘make a statement’. More than a decorative design to greet the eye of the beholder, it is a charter by which the wearer proclaims to the world her whole approach to life and ministry. Our later Church era calls the emblem’s theology ‘incarnational’ for its recognition of the significance of human relationships and its acknowledgement that God is revealed through human life and experience. The Monogram’s spirituality integrates faith and life in the wonderful affirmation that the ministry of generating human happiness is a worthy, holy enterprise and integral to the mission of God in the world.